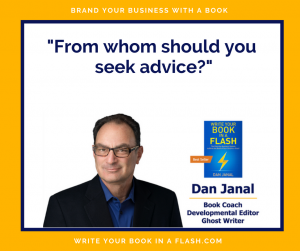 Home/Book publishing/When Writing A Book, From Whom Should You Seek Advice? I learn what’s important to my readers. Let’s see if you can guess the hidden “lesson” from this question. Good afternoon – I’d like to take a moment of your time to ask you a question about the direction of my forthcoming book, which is in its final editing stage. I’m in a bit of a should-I/shouldn’t-I dilemma, and I’d welcome your insights. A few weeks ago, I read a portion of my forthcoming book, “Write Now!,” to a writer’s group, and one member suggested that I transform it into a writing “course” (in book form). Initially, I thought that was a great idea, but now, I’m having second thoughts, so I’d like your opinion. Write Now! was created to do several things including to demonstrate how books can help writers make money beyond traditional royalty income – including helping to land clients, secure profitable speaking gigs, serve as highly-paid expert witnesses in legal cases, and even appear as an expert in the news media. Having taught writing and promotion at four colleges and universities, I’d have no problem turning this into a course in book format … and while I could see people who are already writers seeing benefits in a course, I am having a hard time seeing the target markets I noted above wanting a course if they weren’t already presold on the benefits of a book. So … I ask your insights … does it make sense to transform this into a course in book format, or leave it as a how-to book? What would say to Ned? You are talking about TWO products. Write the book. Upsell to a course. In fact, upsell to everything, but you know that. Your friend is way too binary (either/or). Wow – exactly what I need and didn’t see … and oddly, I’ve got a sort-of sample on my shelf: New York Literary Agent Donald Maass’ book on writing a block buster, and his companion workbook (which could just as easily be an online course). Color me “Duh!” … This is great help, Dan. Thanks! Don’t listen to opinions from people who have good intentions, but who are not experts. Listen to experts and seek their counsel.